Individuals starting their career, those in career transition or those struggling on the path chosen will gain much from this book. 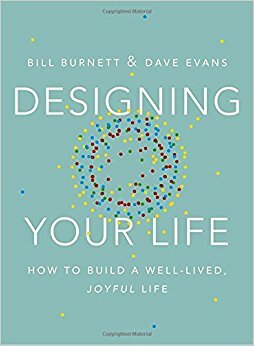 Authors Bill Burnett and Dave Evans are Stanford professors who apply ‘design thinking’ principles to career/life planning. Don’t be fooled, just because the approaches on offer are placed under the “design thinking” umbrella doesn’t mean they are new. Case in point: the age-old practice of the “informational interview” is renamed and repackaged as a “prototype conversation” but the process and end goal of each are the same: interview/ask questions of folks who have jobs/careers you aspire to, “get their story,” and apply it back to you–i.e., could this be a good fit? Overall, however, this is a MARVELOUS book for finding and exploring your various life paths–because we all have many potential paths that could make us happy. The design process is proven effective and involves, at the highest level, several steps: define, research, ideate, prototype, choose, implement, and learn. 4) Failure Reframing – another high impact tool–especially for those in transition — i.e., when self-esteem and confidence can be lower than normal. Essentially this tool involves documenting your “failures,” categorizing and reframing them for the (inevitable) growth and insights gained. Brilliant! Despite my irritation with “design thinking creep” practices going on all too often these days, I have put this book on my Top 2 All-Time Best “Finding Your True Path” books. The tools are just that good. And the outcomes just that helpful. If you need a little help purposefully shaping your life, get this book. And while doing so, get the other book on my Top Two All-Time Best list: Martha Beck’s Finding Your Own North Star. I promise you, you’ll get to where you need to go–where you were born to go–in good time.